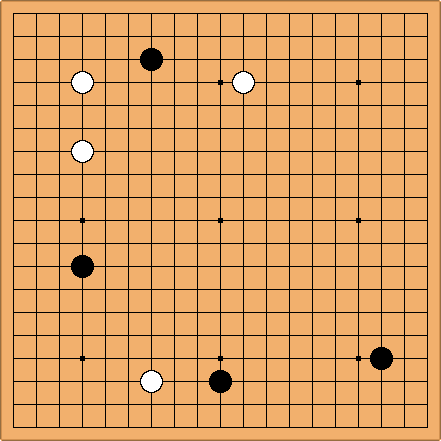 Eight stones, four white and four black, are located randomly on the board, on any points not on the first or second lines. Both players view the position, and make a silent bid on komi - the bids could be negative! The high bidder takes black, giving the komi bid, and play begins. The idea is to create some novel fusekis, and get the payers to "think outside the box" of known joseki. The random points can be generated with dice, a pocket calculator, or otherwise. Any thoughts? R3my It seems like a good idea to me, allot of people always start with the same moves, or josekis. This way the game could go a bit differently. But still it won't change the endgame, and the game could be too much about luck this way. Zinger: Well, it isn't intended to alter the entire game - rather, just to make some new fuseki patterns, and see what kinds of ideas the players come up with. As for the luck, the komi auction is meant to offset this. Of course, a serious mistake bidding komi could be hard to recover from, but that doesn't seem much different from any other serious mistake. nachtrabe: Seems like Wild Fuseki + bidding. zinger: Hmmm, as nachtrabe points out, this is a lot like wild fuseki ... so I guess I didn't invent it. Dang! As for this position, it looks like the random points were restricted to the 3rd and 4th lines, which isn't what I had in mind.